Tim Gloege is a historian and independent scholar based in Grand Rapids, Michigan. He earned his Ph.D. in United States History from the University of Notre Dame in 2007. His first book, Guaranteed Pure: The Moody Bible Institute, Business, and the Making of Modern Evangelicalism, was published by the University of North Carolina Press in 2015. (See Bill’s glowing review of Guaranteed Pure.) Most recently, he contributed an essay to The Business Turn in American Religious History (edited by Amanda Porterfield, Darren Grem, and John Corrigan). Thanks to a grant from the Louisville Institute, he is researching a second book on Protestant liberals in the Gilded Age and Progressive Era. You can follow Tim on Twitter @timgloege. The Moody Bible Institute in Chicago (MBI), a venerable evangelical institution, is hot news. Christianity Today, the Christian Post, even Inside Higher Ed have reported allegations of excessive compensation for administrators and “liberalism” among its faculty. But despite these sensational charges, heresy hunters will search in vain for a whiff of liberalism at this hopelessly conservative school. More than this, and as the chart below reveals, management costs were 4.19% of expenditures in 2017, historically low for MBI and well-within the non-profit norms for administrative overhead. MBI’s Major Expenses, 2005-2017. Chart produced by Tim Gloege, 2018. No, evidence of the real crisis is found in its annual financial and ministry reports, which are summarized in the charts below. MBI’s Revenue Sources, 2005. Chart produced by Tim Gloege, 2018. 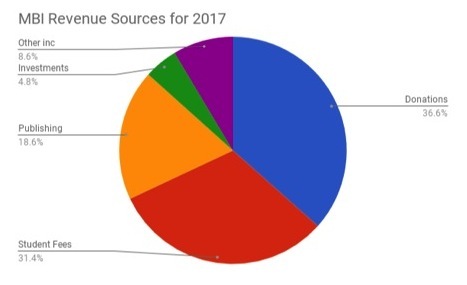 MBI’s Revenue Sources, 2017. Chart produced by Tim Gloege, 2018. MBI’s Revenue, 2005-2017. Chart produced by Tim Gloege, 2018. While it is difficult to trace the precise timing of MBI’s current crisis – given that online financial records begin in 2005 – several contributing factors are clear enough. First among equals is when mainstream publishers discovered the lucrative world of evangelical publishing in the 1980s, and consolidation ensued. Where the sector once was dominated by mid-sized firms, most major evangelical publishers today are subsidiaries of publicly-traded behemoths like News Corp. They have access to resources that dwarf independent publishers like Moody. Today, sure-sellers already have a platform and a following; they go with the deepest pockets, or perhaps form their own in-house publishing concern. Only the unknown, risky, propositions need the validation of the Moody brand. That MBI’s publishing revenues have recovered to pre-recession levels is no small accomplishment, but signs of future trouble abound. While Moody Press published 120 new titles annually in the 1960s, last year it released only 56. Annual ministry reports suggest their most profitable title is Gary Chapman’s The Five Love Languages, first published in 1995. I’m no expert in this sector, but I see no equivalent on their current roster. This lack of marquee authors hurts their bottom line today and diminishes their brand in the future. Moody Radio shows similar signs of stagnation. The million listeners it reaches weekly is unchanged from the decade before. Media forecasters predict steep declines in radio audiences, displaced by the fractured world of podcasts, streaming music, and other on-demand services. Where Moody could have positioned itself as the evangelical NPR of religious podcasting, it is frantically playing catch-up instead. MBI’s biggest miscalculation came with its flagship magazine, Moody Monthly. Like many other periodicals, subscriptions had fallen calamitously in the 2000s. But while others cut costs and shifted operations online, MBI shuttered the magazine through which it had spoken into the issues of the day for a century. This effectively rendered MBI mute; alienating the Moody brand from its longstanding corporate personality. Having rested on the laurels of its old media empire for thirty years, MBI is paying the price today. Evidence of its severely weakened brand is starkly represented in its donation revenues; adjusted for inflation they have yet to recover to 2005 levels. The only thing preventing truly apocalyptic budget shortfalls are increased revenues from student fees. (Today they constitute 31.4% of MBI’s total income, versus 16.5% in 2005.) The cost of providing education has risen also, and now makes up over half of total expenses, up from 42% in 2005. But this focus on education is a historical anomaly at MBI, and given the state of higher education, as risky as a hand of cards with Jerry Jenkins. When enrollment declines, as happened last year, the fixed costs remain. From this perspective, the decision to shut down its Spokane campus may simply be a return to its traditional ratios. MBI’s newest building project, the Gary D. Chapman Center, seems to be another investment in public ministry. Opening this spring, it will house both the publishing and radio departments and provide space for new digital publishing and multimedia production. But all this will be for naught without a concerted effort to rehabilitate the Moody brand. 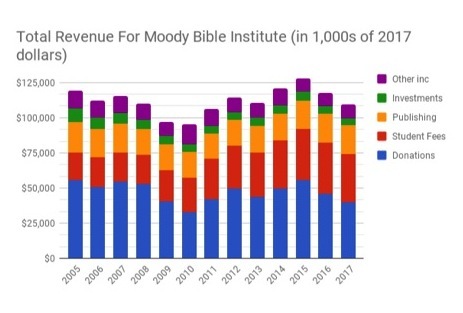 As it stands, the 79 million self-identified evangelicals who have never listened to Moody radio are as mystified by the “Moody” label as the average Katy Perry fan. For these evangelicals, the names that they trust lie elsewhere. Moody has become the Sanka of evangelical brands; it’s still around, but you probably don’t know it. Whether Moody is still with us in twenty years remains to be seen.